Geographical and historical studies usually present different types of cities in the Balkans: Greek, Roman, Byzantine, German, Slavic, Turkish/Oriental, etc. During the last decades, a number of studies tend to present the “Turkish” or “Oriental” cities in the region as “Balkan cities”. They insist that there are major differences between the cities in the Balkans during the Ottoman period and the so-called Islamic cities, and point fi rst and foremost to the rich and influential pre-Ottoman urban heritage. According to this view, Balkan cities were subjected to important oriental infl uences but preserved their most important characteristics and were modernized according to the European pattern (i.e., re-Europeanized) in the 19th-20th centuries. The present article attempts to examine the inner contradictions of this interpretation. It demonstrates that everything considered specifi c to the Balkan cities is in fact valid also for the cities in Anatolia and, in many cases, for a larger area. As a whole, the concept of the “Balkan city” results from an artifi cial retroactive “Europeanization” of the region’s history, which might be misleading with regard to the study of its urban past as well as the evaluation of its urban heritage. Alexander Vezenkov is a historian, freelance scholar. 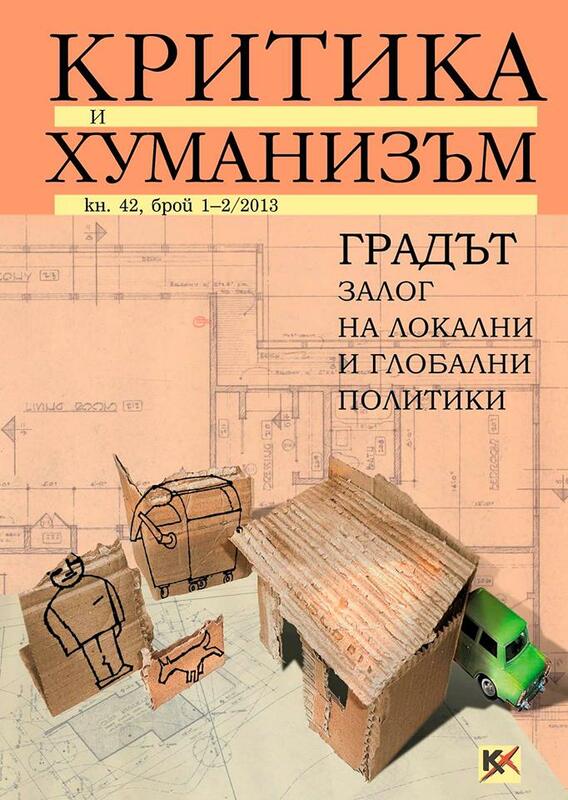 Among his publications are: “How a Sad Reality Became Cultural Heritage: Our Old Small Towns” (in S. Detchev (ed. ), In Search of the Essentially Bulgarian: Networks of National Intimacy 19th-21st Centuries; 2010; in Bulgarian); “Urbanizarea şi reţeaua urbană în Sud-Estul Europei” (in M.-L. Murgescu, S. Câlţia (eds. ), Exerciţii întru cunoaştere. Societate şi mentalităţi în noi abordări istoriografi ce; 2003); “The Grand Bazaar in Istanbul: Imagined and Real, Then and Now” (Iztorichesko Badeshte, 1-2/2003; in Bulgarian); “Réformes et changements sociaux dans une ville ottomane au XIXe siècle: le cas de Sofi a” (Etudes turques et ottomanes. Documents de travail, 9-10/2001). His research interests include 19th and 20th century urban history, institutional history of the communist regimes as well as various aspects of the Tanzimat period in the Ottoman Empire. The article focuses on the images of the modern city and urban culture on the conceptual map of Bulgarian eugenics projects. The eugenic rhetoric of “degeneration” and “regeneration” is studied in its links to certain culture-political visions of modernity, national identity and citizenship. The analysis addresses the following questions: Why and how did eugenics in Bulgaria imagine the city as a location of disease and decay? How did the eugenics discourse suggest to “normalize” degenerate urban dwellers? In what “doses” did eugenicists prescribe the rustic way of life as a healthy antidote to urban degeneration? In trying to answer these questions, the study identifi es the points of divergence and intersection between eugenics and social hygiene in Bulgaria. These were the two main strategies of biopolitics, which specifi ed the hygienic needs of citizens and peasants as members of the “national organism”. The article examines how eugenicists and social hygienists constructed, but also destabilized, a rural/urban dichotomy. It was derivative from a series of other oppositions: health vs. disease; nature vs. nurture; purity vs. dirt; autochthonous vs. alien, modernity vs. tradition. Eugenics in Bulgaria is therefore studied as a multiform hygienic utopia which confl ated conservative anti-liberal and anti-urban traditions with modern aspirations for bio-social engineering. Gergana Mircheva graduated in Law and in Cultural Studies from Sofia University. She is currently a doctoral student in History of Modern Bulgarian Culture at the Department of History and Theory of Culture, Sofi a University. Her recent publications include: “Marital Health and Eugenics in Bulgaria (1878-1944)” (in M. Turda, S. Trubeta and C. Promitzer (eds. ), Health, Hygiene and Eugenics in Southeastern Europe to 1945; 2011), and “Physical Education in Bulgarian Schools, 1918-1944: The (Re)Production of Masculinity and the Re-Creation of the National Body” (Women’s History Review, 4/2011). Her research interests are in the fi eld of cultural and social studies of medicine and eugenics, modern Bulgarian culture and urban studies. Building the socialist city: Egalitarianism versus monumentalism? Addressing the question of what was essentially socialist about the socialist city, this paper looks for its specifi city beyond the sheer urbanist artifact – the urban layout and the architectural form – into the political economy that enacted its construction. Despite focusing on the city center of Sofi a and particularly on its political core designed in the early 1950s, the analysis highlights processes of space production transcending the case study. On the one hand, it exemplifies the interactions between the various institutions in the expanded and partydominated bureaucracy: competition over resources and administrative privileges; clashes between technocratic and party rationales; forced and failed cooperation among state agencies; discrepancies between chains of command and coordination of expertise. On the other hand, it elucidates the political compromise with the professed egalitarian model of development and the party’s commitment to improving living conditions for society at large resulting from the exorbitant investment into the monumental embellishment of the city center as a power seat. Finally, the paper emphasizes that, far from being monolithic and straightforward, the implemented model of the socialist city was shaped as much by deliberate policy-making as it was infl uenced by systemic defi ciencies and structural impediments in the institutional landscape of state socialism. Elitza Stanoeva holds PhD in History (Technical University, Berlin). Her research is situated in the fi elds of urban studies and history of socialism. Among her publications are: “Interpretations of the Ottoman Urban Legacy in the National Capital Building of Sofi a (1878-1940)” (in E. Ginio and K. Kaser (eds. ), Ottoman Legacies in the Balkans and the Middle East; 2013); “The Dead Body of the Leader as an Organizing Principle of Socialist Public Space: The Mausoleum of Georgi Dimitrov in Sofi a” (in M. Behrensen, L. Lee and A. S. Tekelioglu (eds. ), Modernities Revisited; 2011); “The Central City Square as a Legitimation Resource: The Main Square of Socialist Sofi a” (Critique & Humanism, 35/2010). She is a member of the Editorial Board of Critique & Humanism journal. This text traces the dubious adaptation of the Bulgarian post-socialist city to the contemporary globalization processes and the inevitable transformations produced by it. It analyzes whether our city corresponds adequately to the postmodern heteropolis – a term coined by Charles Jencks, a historian of architecture, to signify the specifi c condition of the contemporary city with powerful growing fragments that contain the core of a mixed and complex urbanism offering an alternative to the dominant paradigm of the classical modernist urbanism. Through multiple examples, this text attempts to prove that de-sacralization of ideologically charged public spaces is a step towards such adequacy. Herein, “ideologically charged spaces” refer to the formal public zones for demonstration of the totalitarian ideology that are subjected to forced, centralized urban interventions. Eventually, it is concluded that exactly this desacralization gives the contemporary post-socialist Bulgarian city that spirit of freedom and heterogeneity which would most successfully facilitate its entering into the field of the global heteropolis. Aneta Vasileva is PhD Candidate at the Department of History and Theory of Architecture at the University of Architecture, Civil Engineering and Geodesy (UACEG), Sofia. She is researching the development of Bulgarian post- WWII architecture in an international context. Since 2007, she writes on architecture in http://whata.org/blog-en and acts as a co-curator and project manager of architectural events and exhibitions. Since October 2011, she cooperates with the National Institute for Immovable Cultural Heritage team in the international project ATRIUM (Architecture of Totalitarian Regimes of the 20th Century in Urban Management). She contributed as a co-curator, author and editor of the Architectural section of the book Bulgarian Nouvelle Vague (2012). From the city of dreams to the city of fountains: Representations of the new "Bulgarian dream"
The article inquires into the factors, agents and practices which have been shaping the visual imagery and aesthetics of the new housing developments in the years of post-socialist transition in Bulgaria. It examines critically the proposition that post-socialist urban landscape can be interpreted as a visual and spatial articulation of the ruling neoliberal mechanisms and policies, and as an outcome of the rational choices made by entrepreneurs, architects and potential home buyers. The article sets to establish how the representations of the new “Bulgarian dream” are constructed on both the supply and the demand side of the housing real estate market, and to what extent the resulting images – the actual image of the dwellings built, the advertised image and the image of the dream home – correspond to each other. The implicit question brought up by the article concerns the “power” and the “right” of the consumer-resident-citizen to choose and to participate in the “making” of the place he or she inhabits, having a say in both its functional and aesthetic characteristics – in other words, to exercise his or her “right to the city”. Svetla Kazalarska has PhD in Cultural Anthropology (Sofi a University “St. Kliment Ohridski”, 2011). She has been working at the Institute of Ethnology and Folklore Studies with Ethnographic Museum, Bulgarian Academy of Sciences as a museum curator since 2012, and as an Assistant Professor in Museum Studies since 2013. She is the author of The Museum of Communism between Memory and History, Politics and the Market (2013; in Bulgarian). Her research interests are in the fi elds of collective memory studies, cultural heritage and museum studies, urban anthropology, historical anthropology of socialism, visual studies. The paper analyzes how US concepts shaped urban policing in Germany. It makes both a theoretical and an empirical argument. Firstly, it assesses the analytical value of the urban policy mobilities approach towards urban restructuring. It advocates a combination of Marxist and Foucauldian approaches rather than the common use of the assemblage concept. This aims at avoiding fl at ontologies by focusing on 1) strategic to unconscious exercise of power, 2) the interplay of different spheres (e.g., discourse, subjectivities, material practices, organizational structures), and 3) both temporary solidifi cation of and openings in power relations. Secondly, it shows how the German engagements with US policing strategies functioned as roll-back discourses promoting local shifts in power relations. Policy transfer was often not intended and roll-out remained contingent, yet cannot incidentally be characterized as neoliberal. Jenny Künkel is Scientifi c Assistant at the Institute of Human Geography of Goethe University Frankfurt, working on the research project “Policing Frankfurt a.M. American Style?”. Her research is situated at the intersections of urban studies, criminology and political science, and focuses on power relations along sexuality, gender, fi tness, class and race as well as their contestations. She recently co-edited Neoliberal Urbanism and Its Contestations: Crossing Theoretical Boundaries (with M. Mayer; 2012). In the late 1960s, Toronto Union Station was threatened by demolition. As a result of diminishing importance of railway travel coupled with the move of manufacturing facilities to the metropolitan periphery, large portions of the railway lands became underused. In a parallel process, downtown was becoming rapidly overtaken by business and entertainment. Facing the need for maintenance, the city navigated between the options to remake, retain and modify, or reuse its material. Although various plans were discussed and approved within a span of 50 years, none of the proposed renovations of Union Station was ever implemented. Grounded in the case of the station, this study addresses the conditions for the growing resistance to modernist mega remakes from the 1960s and the transition to more historically and environmentally conscious plans to retain the building. It examines the underlying shifts in the planning practice and discourse with regard to public participation, diversity and public good. Stefka Lubenova has graduated in Sociology from Sofi a University (Bulgaria) and York University (Canada). She has been a researcher at the Culture of Cities Project in Toronto since 2000. Her main areas of interest are sociology of the city and sociology of culture, urban planning and renewal as well as classic and contemporary sociological theories. The article addresses the problem of unused industrial urban spaces – based on the example of Sofi a and its possibilities for reuse – by analyzing the links and interactions between the creative industries and (post)industrial structures. It presents the results of practical research and projects on the subject, and discusses the problems confronted by the future development. A hypothesis is confi rmed – and its applicability to Sofi a – that the “creative (post)industry” can form a complex spatial, social and economic system that can replace the industrial one. Dimitar Mehandjiev graduated in Architecture in 2008 at the Urban Planning Department of the University of Architecture, Civil Engineering and Geodesy, Sofi a. He has recently defended his PhD dissertation concerning the adaptation of unused industrial territories at the Bulgarian Academy of Sciences. He works in Sofi a, independently as an architect and in “Transformatori” Association, on the problems of urban environment, the postindustrial urban space and urban renewal. Iliana Ovcharova graduated as Master of Architecture at the Department of Industrial Buildings of the University of Architecture, Civil Engineering and Geodesy, Sofi a (2007). In the period 2009-2012, she was PhD student at the Institute of Art Studies, Bulgarian Academy of Sciences, working on the topic of re-use and adaptation of abandoned industrial buildings and structures. Business Improvement Districts (BIDs) – public urban space organized by private business stakeholders – have evolved as an “innovation” in urban governance supposed to function as a reaction to inner-city decay. The respective interplay of the business community, public police and rent-a-cops represents local governance regimes in exclusionary action. The paper analyzes the concept of BIDs with regard to its controversial legal (constitutional), spatial and humanitarian impacts. Evidence for the critical challenges that are brought about by BIDs is taken from case studies in the City of Hamburg, Germany. Volker Eick is a political scientist at Humboldt University Berlin, Institute for European Ethnology. He has authored numerous articles and chapters on urban security regimes, state and non-state policing. His most recent publications include: Urban (In)Security. Policing the Neoliberal Crisis (edited with K. Briken; 2013); “Polychrome Policing in Germany” (in R. Lippert and K. Walby (eds. ), Policing Cities; 2013). The article discusses the protests of the summer of 2013 in Istanbul as a struggle for the discursive hegemony over the city’s past. In the context of developing Istanbul into a global city, the administration attempted to impose a vision of the city’s past as an Islamic imperial capital in conjunction with Ottoman imperial glory and neoliberal economics. This clashed with competing visions of the city as an Eastern Roman capital, multicultural, a resident-centered cosmopolis, a theater of a modernist Turkish state, or a site for leftist struggle suppressed in blood. Gezi Park stood for the right to the city (Lefebvre) articulated through these historical visions. Malte Fuhrmann is teaching at the Turkish-German University, Istanbul. He studied History and Balkan Studies and completed his dissertation at the Free University Berlin. He has worked as a researcher at Zentrum Moderner Orient, Berlin, and Orient-Institut Istanbul, and has published extensively on the cultural history of Eastern Mediterranean port cities, German colonialism and Orientalism, and railways as lieux de memoire. He has co-edited The City in the Ottoman Empire: Migration and the Making of Urban Modernity (with U. Freitag, N. Lafi , F. Riedler; 2011) and is author of the articles “Save Haydarpaşa: A Train Station as Object of Confl icting Visions of the Past” (in R. Roth and P. van Heesvelde (eds. ), The City and the Railway in the World, 19th to 21st Centuries; forthcoming 2014) and “Beer, the Drink of a Changing World: Beer Consumption and Production on the Shores of the Aegean in the 19th Century” (Turcica, 45/2013; forthcoming). How politics was swallowed up by policies, both conceptually and as an orientation of practical social action, how policies in turn appeared to be just another name for administrative governance: Sofi a’s general public had the rare chance to learn that by experience. On 14 June 2013, several thousand people flooded the “Independence” square, named “Lenin” before 1989, to recapture it from what public spaces turn into under the predominance of everyday modality of social being together: that is, veins of traffi c. Totalization of everydayness renders traffi c and garbage to be the chief references of shared social living. Since 14 June 2013, however, a scandalous appointment of a suspicious person on a high-ranking state offi cial’s position subsumed the fractured role performances of a signifi cant number of Sofi a dwellers under the totalizing force of their civic identifi cation and threw them into protests against the current governance. This interrupted the totalization of everydayness and allowed for te re-appropriation of the public character of the obscured public spac s. This ecstatic mode of re-appropriation however cannot resist the forces of mu danization for long. The everydayness unavoidably strikes back. Milena Iakimova is Associate Professor at the Department of Sociology, Sofia University “St. Kliment Ohridski”, member of the Editorial Board of Critique and Humanism journal. She is the author of the monograph Sofi a of the Plebeians: The 20-ies of the 20th Century (2010; in Bulgarian). Fields of interest: urban studies, social theory and pragmatism, qualitative research methods. The refugee and the city: Is the camp indeed a space of exception? This article engages the Agamben-Agier perspective which has become dominant in the last few years but has received poor criticism. Both Giorgio Agamben and Michel Agier at times defi ne the refugee camp in relation to broader scenarios. While Agamben thinks about the camp to defi ne the modern nation state and law, Agier often digresses from the camp with the city in mind. While both works teach us a great deal about the nature of the camp, discussing some of their limitations is essential even to fully develop their own potential. This article aims at contrasting key elements of the Agamben-Agier perspective to my own experience with Palestinian refugee camps in Lebanon. Three main questions structure this paper: Is a refugee camp indeed a space of exception? Should we understand the refugee camps in their symbolic and practical continuity or discontinuity to the urban space? Should we consider the camp as having the same properties as the “city” in Agier’s sense? Leonardo Schiocchet, PhD in Anthropology from Boston University, is a postdoctoral researcher of CAPES (Brazil), and guest researcher at the Institute for Social Anthropology at the Austrian Academy of Sciences and at the Islamic Cultures and Societies Research Unit at Aarhus University (Denmark). His latest publications include: “Far Middle East, Brave New World: The Building of the Middle East and the Arab Spring” (The Perspective of the World Review, 3/2011); “Palestinian Sumud: Steadfastness, Ritual and Time among Palestinian Refugees” (in Birzeit Working Paper Series; 2011); “Refugee Lives: Ritual and Belonging in Two Palestinian Refugee Camps in Lebanon” (in M. Behrensen, L. Lee A. Tekelioglu (eds. ), Modernities Revisited; 2011). His research interests are in the fi elds of anthropology, Middle East studies, Islamic studies, Palestinian studies, and refugee studies. This paper examines the concepts of “exclusion” and “marginality” which have become increasingly popular with regard to the study of urban inequalities in the last two decades. Discussing matters of defi nition, elaborating on conceptual and political backgrounds, and studying the application of the two concepts in empirical research, it is argued that both concepts can hardly be applied as “ready-made” tools, yet empirical research can gain a lot from taking them into account and using them as a source of intellectual stimulation. For this, the paper identifi es fi ve areas in which past conceptual work can productively inform empirical research on urban inequalities. Matthias Bernt, PhD, is a political scientist specialized in Urban Studies. He works as Senior Researcher at the Leibniz Institute for Regional Development and Structural Planning (IRS) in Erkner (Germany). Among his publications are: Peripherisierung, Stigmatisierung, Abhän-gigkeit? Deutsche Mittelstädte und ihr Umgang mit Peripherisierungsprozessen (edited with H. Liebmann; 2013); “The ‘Double Movements’ of Neighbourhood Change: Gentrifi cation and Public Policy in Harlem and Prenzlauer Berg” (Urban Studies, 49:14/2012); “Partnerships for Demolition: The Governance of Urban Renewal in East Germany’s Shrinking Cities” (International Journal of Urban and Regional Research, 33:3/2009). His work focuses on urban politics and governance, gentrifi cation and renewal, and urban shrinkage. Laura Colini is an architect with a PhD in Urban and Territorial Studies. She works as Senior Researcher at the Leibniz Institute for Regional Development and Structural Planning (IRS) in Erkner (Germany) and is also affi liated at ENEC, Paris IV Sorbonne. Among her publications are: “Against Divided Cities in Europe Cities of Tomorrow – Action Today” (with D. Czischke, S. Güntner, I. Tosics and P. Ramsden; in URBACT II Capitalisation; 2013); “Inclusione Sociale” (in Contesti; 2012). She is also a co-author of Urban Development in the EU: 50 Projects supported by the European Regional Development Fund during the 2007-13 period. Final Report (with P. Ramsden; 2013). Her work focuses on urban governance, renewal, and related issues of social inclusion/exclusion, and public participation. The article looks into the genesis of segregated places which do not fi t in the legal, cultural and spatial environment of the city. These are peculiar, contradictory and non-typical places inhabited by poor and vulnerable people who are generally rejected by their neighbors. On a small scale, the inhabitants are households or groups of households settled illegally in a neighborhood or unable to maintain their accommodations. On a larger scale, such places – especially when they grow to become large clusters of housing or even whole neighborhoods – are transformed into permanent ghettoes. The information used in the article was collected in 2012 by the social services of the city of Sofi a in an effort to identify children living in extreme poverty and substandard housing conditions. Based on this information, the article analyzes the patterns of generation of new pockets of poverty. The observations are generalized based on the understanding that the city is a complex spatial and temporal process. In the context of Lefebvre’s ideas and interpretations, we could call this process a production of new spaces which turn out to be spaces of inhomogeneity and inequality. Boyan Zahariev, PhD, is Program Director with the Open Society Institute in Sofia managing projects for the social integration of vulnerable groups. He has published articles and participated in the drafting of analytical reports related to poverty and social exclusion, among then: Bulgaria: Household Welfare during the 2010 Recession and Recovery (coauthor; 2012); “Prejudice and Discrimination on the Labor Market” (Obektiv, 196/2012; in Bulgarian); “Entwisted Streets: Analysis of Detached Urban Areas in Sofi a and Plovdiv Using Spatial Syntax” (Year-book of Sofi a University, Philosophy Faculty, Sociology Book, 103/2011; in Bulgarian). Veronika Dimitrova is Assistant Professor at the Department of Sociology, Sofia University “St. Kliment Ohridski”. She is a co-author of the book Portraits of Disappearing Sofi a (2012; in Bulgarian). Fields of interest: urban studies, history of medicine. “Student town is not the same!” This is what part of the participants in a dialogue about life in Sofi a’s Studentski district (Student Town) exclaimed in front of the media. Others explained that “it has always been like that”. The change in the statute of the estates, the restitution, the transfer of the right to use, renting – these represent only some of the processes evoking confl icts among the interested parties, especially in the media, mainly in the period 2008-2012. This is the period when a series of homicides in the quarter of “Student town” occurred after collisions between students. Building on the thesis that in this area of the city real and imaginary communities interact, the article pursues the question: How does the talk about “Student town” change throughout the years? The text presents the results of a study of texts about students’ life at the edge of the city that were published within the last twelve years in two newspapers – Novinar and Dnevnik. Zhana Popova, PhD, is Assistant Professor at the Faculty of Journalism and Mass Communication, Sofi a University. Author of Dialog Models: Between Events and Media Images (2013; in Bulgarian) and the research on the attitudes and dialogues in the city “The Business Park – a City within the City” (Yearbook of Sofi a University, Philosophy Faculty, Sociology Book, 103/2011; in Bulgarian). Her main interests include: electronic media, genres, memory and media, crises and confl icts, relationship media-sport city.